I never intentionally buy mechanical pencils but they turn up in job lots that I buy. I know little about them but admire their mechanical ingenuity. Often, there’s a relationship with pens by the same maker. I just clean them up and send them back out into the world, but I enjoy their colours and style. The pencil at the top is an offering from Scripto. It has no particular value but it’s colourful and practical. It looks quite similar to a wooden pencil, to my mind. The next one down is a handsome advertising pencil, a well-made piece. The muted colours are reminiscent of some of the patterns used by Conway Stewart in their Dinkies, which makes it possible that this is a Bina & Barrey pencil. 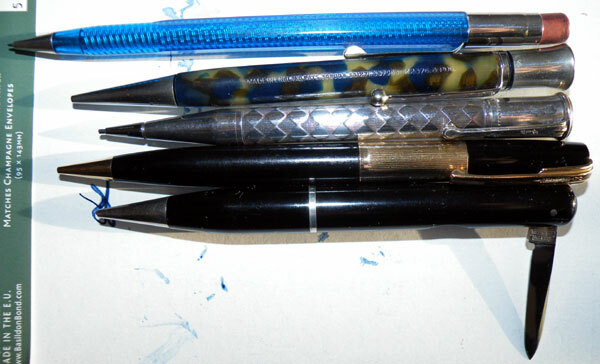 The third one is a Jif Waterman metal pencil, and very beautiful it is too. Much as I studied the clip, I was unable to see any resemblance to their pens. The fourth one is a Waterman with a very broad band, clearly a relation of the Taperite. I think the pencil looks better than the pen. The final pencil is probably the best made of them all, a Strad which incorporates a penknife blade. While it’s beautifully executed, you’re inclined to ask why? What would you be cutting with it? You have a mechanical pencil so you wouldn’t need to sharpen it… I’ve no idea where Strad pencils were made, but I’ve seen other ones, including a woodgrain MHR example that must have been at least seventy years old. It had a set of feeler gauges in case you wanted to adjust your tappets or check your spark plugs while you were sitting at your office desk. It’s one of those wonderful answers that never found a question, I think.